The structure of your start.me menus has been simplified. We lately received quite a lot of questions like ‘How do I…?’ and ‘Where do I find…?” and that made us think. By simplifying the menu structure, we hope it will be easier to find what you are looking for. The ≡ pages menu (that we informally used to call the ‘Hamburger’ menu) has been removed. Most users found it confusing to find their pages both in a menu and in the header. We introduced an ‘Add’ button (in the position of the former Hamburger menu) that can be used to quickly add a widget or page. The add button after the page list in the header has been removed. In a new ‘Wrench’ menu we bundled all activities related to customizing your pages and overall experience, like editing a page, changing the background image and changing settings. In the near future, we will add options to change a page to a ‘Dark’ theme and adjust the transparency of the widgets on a page. In the coming weeks we will apply an update to the general look and feel of start.me as well. 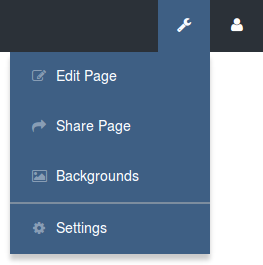 No big changes, but we will try and make it look even better than it already does and giving you more options to customize your pages.